“Can I get information on swim lessons?” has been our most popular question lately so we've tried to put it all in one place. If we've left something out please post in the comments and we will add it to the list. Thanks to everyone for their input! The City of Corpus Christi provides Jeff Ellis Learn-to -Swim Program. Lessons are offered for ages 6months to adult. Classes are offered Tuesday through Friday for two consecutive weeks. Lessons are available at Collier, Natatorium, Oso, and West Guth Pool. Minimum 2/Maximum 6 per class. All classes are 30 minutes long. Missed classes cannot be made up. Summer Registration for Session will begin Friday, June 28 at 8:00a for the Natatorium, Collier, West Guth, and Oso. All registration will be online! Basic water adjustment program for infants and toddlers ages 6 months through 5 years that builds swimming readiness by emphasizing fun in the water. Parents/guardians are required to get in the water with the child. Parent and Child Aquatics meet one day week, for 4 weeks. American Red Cross Learn-to-Swim group lesson program! Enroll your child in our group lessons where your child will be able to interact socially with other students of his/her same ability. All levels are open to all ages. Instructors can help you determine in which level your child should be placed or pick up a brochure which lists the skills learned in each level. Do you want to work on your technique, or are you just getting started and want that one-on-one instruction? Each class is 30 minutes and can be scheduled at a time that is best for you. The YWCA teaches in accordance with the American Red Cross guidelines. All sessions begin the first Saturday of the month for children and the first Thursday of the month for adults. All new students must take a freer-term skills test to ensure their correct placement. Most classes are half an hour-long, however, some advanced classes are 45 minutes. There are no make-ups / credits, without a medical excuse from a doctor. There are generally no classes on major holidays, but do check the schedule. Saturdays: 10:00 - 10:30 a.m.
YMCA aquatics programs, children learn to be safe around water and they feel the sense of accomplishment that comes with learning something new in a positive, caring environment. Kids can develop lifelong skills that can help them stay healthy. Parent/Child Aquatics: This course helps young children (6months up to 5 years) become comfortable in and around the water so they are ready to learn to swim. 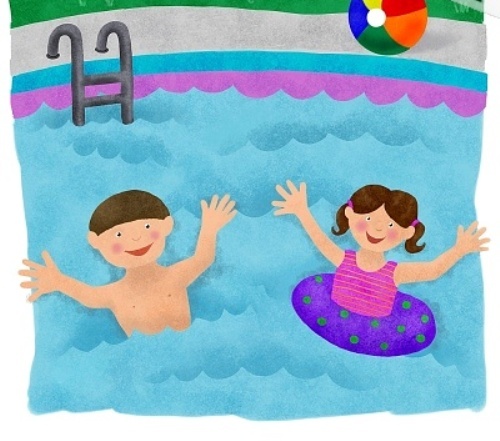 The course gives parents information and techniques to help orient their children to the water and to supervise water activities in a safe manner. Parent/ Guardian are required to be in the water with child. Private Swim Lessons: Private lessons may be scheduled on an individual basis with certified instructors through Recreational Sports. Lesson times are limited by instructor and pool availability. The fee structure is based on the number of private 1/2 hour (30 min.) sessions the participant schedules with the instructor. Leave your name and number for Jeanne Huff to call you to schedule swim lessons. Private lessons are $15 per half hour and $25per hour. The pool is now open Saturday and Sunday from 1:00 - 6:00pm. Family memberships for the whole summer for new members $375 which includes the onetime $50 registration fee. For returning members $325. Swimming lessons-Swim America group and private lessons. Call for more information. Flour Bluff Fast Frogs offers Swim America Youth Swim Lessons. Swim America is a national learn to swim program operated by the American Swimming Coaches Association through over 500 Program Directors at over 900 sites across these. It's the state of the art learn to swim program in the world today. Programs typically begin offering lessons at 6-9 months of age. Pool is located at the Wranosky Gym in the Flour Bluff School District on the High School side of Waldron Rd. between Central Office and Central Kitchen. All swim lessons are $35.00 per student. Classes ongoing, visit website for full schedule. The sessions are 30-45 minutes long and start as low as $25.00 per session. Please contact the Aquatics Specialist at 777-3301 if you are interested in scheduling private lessons for your child. Group Swim Lessons - Our swim lessons are available all summer long. Our instructors will match your student with like skill levels for a fun learning experience. Private Swim Lessons - These one-on-one lessons are custom designed to fit your needs and your schedule. Please call for additional information at 361-758-7770. Ages 6 months - 2 years old will have lessons from 10:30 to 11:10am only. Parents must be present in pool with children 2 and under. Class Times for 3 years and up are 9:40 am and 10:30 am Tuesday thru Friday for 2 weeks.